Who hasn’t ever dreamed of having a treehouse? Now if you never got the chance to have one, perhaps a trip to Hawaii is in order. 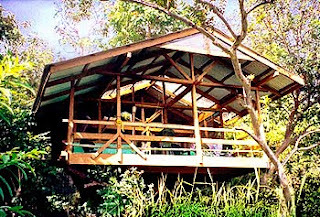 Hana Lani Treehouses gives you the chance to really live in a treehouse on your vacation, although you shouldn’t expect it to be like a little hotel that just happened to be built atop a tree. The website reminds people that these are real treehouses in a real jungle, and they come with an outhouse which you’ll be pleased to know has a regular toilet and hot shower.